Seriously, as a man who wears a skirt, I like it. 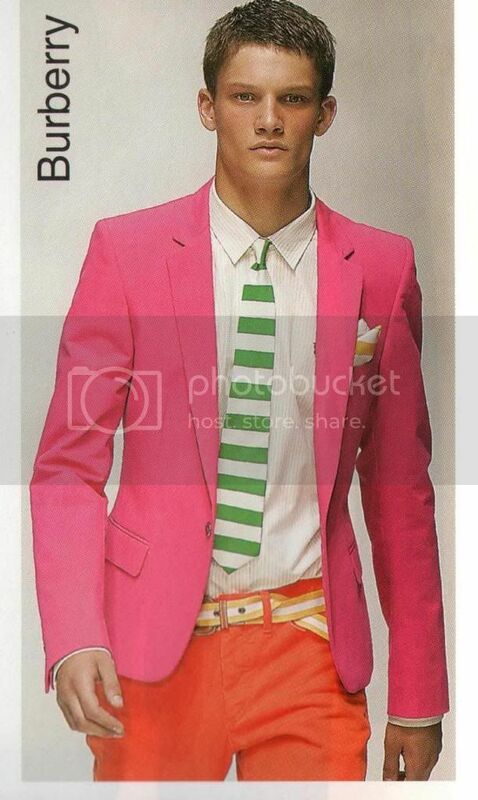 In fact I think SG would looks good in this ensemble, add a felt hat and an Edelweiss in his lapel and he'd be set. A "waisted" coat can still be cut with just the darts. How many darts are we talking about? I find it very difficult to cut ladies' coat without extra panels. It can be very difficult cutting masculine styled lounges for ladies' without them because the distortion introduced by overworking the seams to produce waist suppression can be quite severe. You cut down through the underarm seam to the hem, and upwards reaching the armscye to form a side body. You also cut along the side pocket forwards through to the front dart and backwards until you reach the side seam. Then you close the front dart from 48 to 50. This just displaces the extended front dart through to the side panel. The difference is only one of dart transference from one place to the other. What I usually do to fix this is to set the side body straighter, which means that I let out it's side seam and take away at the front seam. From the distortions at the front I should have to let out the front dart, but that is not possible. 1) Somebody decided to take the easy route and take in the CB seam at waist level in a fish dart style, which is something I dislike entirely. It adds shortness to the back plus it disturbs the run of stripes and checks. 2)Shoulder slope: This is hard to tell, since the shoulders are significantly wider than the shoulders of the wearer, so they drop a bit beyond the shoulder bones. And yet, it is often seen as a "style" feature. Still, I think the shoulders could be a tad straighter. The wide scye and the waist suppression pulls down the back, so when you finally assemble the shoulder seams you create folds under the arm. 4) The height of the sleeve crown: This is most likely the real cause of this mess under the arm, along with point #3. I see this a lot at work, when they haven't adjusted the sleeve crown to the changes made to the shoulder width. Since the shoulders of our coats are usually a bit too wide we reduce them at least 1 cm, sometimes more, and the sleeve crown is not altered by the same amount. So our sleeves pull up, showing a vertical fold at the front and back. They also tend to push down the scye, causing unsightly folds under the sleeve. Once you remove the sleeve the side body will become less disturbed. 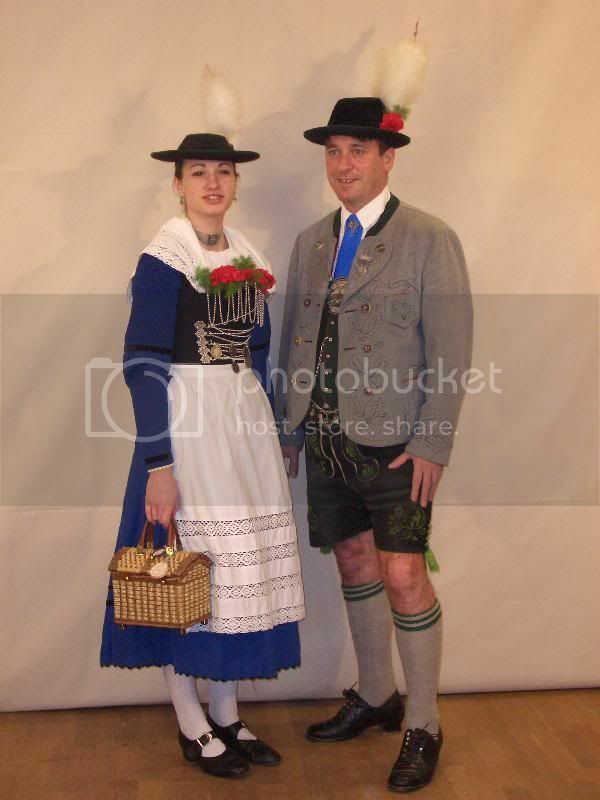 In fact I think SG would looks good in this ensemble, add a felt hat and an Edelweiss in his lapel and he'd be set. Not all Germans wear Lederhosen and Edelweiss, or a Gamsbart (or some flower parts) on their felt hat. Plus I am from the North of Germany, so no Schuhplattlern, too. The german text about waist suppression from "Der Zuschnitt" (don't remember which one - I have it somewhere) says something like "after the alteration, the drags are gone and there still is enough of a hint of waist suppression.". When I read it, that sentence made me laugh. How can you tell your customer that the waist can't be suppressed any further if he likes a slim cut? That coat is straight and boxy. I'd be interested in a discussion on how to properly get a good amount of waist suppression since that is what many young clients are asking for. I'm sure there's many solutions. In theatre, I might use another dart not to have to ironwork too much. There's the waist seam of course, like in body coats or ladies' wear. But I mean, there are workarounds. 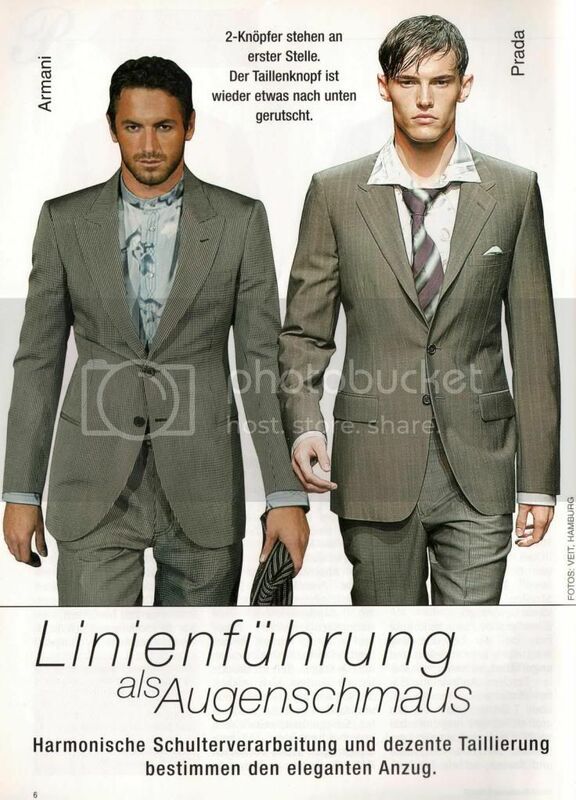 Or how do so many british tailors get that very waisted look without drags and distortions? The point is that it doesn't lay flat. If you lay a coat with a deep chest dart on the table, instead of lying flat you will see the chest area bulge out. This also means that critical measures and points eg width of back etc are no longer to be at the points you thought they were when you applied them to the draft. The point is that it doesn't lay flat. If you lay a coat with a deep chest dart on the table, instead of lying flat you will see chest area bulge out. This, I do completely understand. Don't get me wrong. shortening distances between points etc. Laying "flat" is just a simplification. Laying it on a flat surface, if you prefer. Thing is, I still see a difference between the shortened distances (which do create drags) and the amount of length that is thrown towards the CF and the CF in this picture. Of course, that is here due by the way of suppressing and for such a specific cut, with no real inlays, solution is to "unsuppress". Anyhow, that length on the table might have its use on some body types. Besides that, if you have a coat cut with flare to the skirt, then that length will form anyways if you lay it this way on the table (hem and body portion being as "flat" as possible), no matter how much the waist is suppressed. Like fitted womenswear, you couldn't lay it "flat" but would have to consider the upper body part on one hand and the lower skirt part separately. That doesn't mean though, that it can't fit a body without drags. Anyhow. My point is that even if this particular Rundschau coat could only be saved by lessening waist suppression (and they don't whine about the lack of it anyways since they like it straight and boxy - and in the end it seems to be in the 60ies so that's a style element as well), if it's very possible in womenswear to get a good waist suppression, then why not look for how to achieve that in men's wear? Nobody interested in some research...? Iis it because you think it's too ambitious, or pretentious, or something else? I am! But I'm sorry, I'm not a discussion partner for you. In ladies clothes - when I want to suppress the waist more at side seam than usual I add width and length over the hip. Waist suppression on a man's coat is frequently just a trick of the eye. I've fitted 2 days ago a coat where there was actually very little waist suppression (4 cm only on the half-body). But with a high waist and darts in the right place, it makes the coat quite slimming. Customer thought it was nicely suppressed, when it was not. Making a fuller chest, with a hint of drape (but no real drape) works pretty well, and makes no drags of excessive waist suppression. For the back, the trick of the eye is made with the shape of the seam from back to side body. It is possible to give it some shape, which looks like there was a strong dart, when there is actually a quite manageable dart. I also found by ripping this seam and pinning it back in place (draping on the customer, actually) that there is a strong correlation between balance and waist suppression : when you increase the suppression in this seam, the back needs to be move a little higher. About the hip area on this seam : there can be 2 reasons for waist/hip suppression : big hipbone, or big seat. Depending on this, the shape of the seam is different. Sometimes, it's a straighter back and curvier side body (big hip), sometimes it's a curvy back and straighter side body (big seat with well defined waist on the back). Some customers like the coat to underline their seat, with a hollow back, others want to hide it, with a coat kept at distance in the waist so that it looks flatter. This is managed with the shape of the side seam, on the back panel. So it's not as much a question of number (the strength of the dart hidden in this seam), but of shape of the seam itself. I think there's also another thing. It's how clothes feel. Some people like their jacket to fit very closely to the body. For whatever reason. Because they lost weight or because fashion ideals tell them slim is in or because they used to wear clothes that are one or two sizes too small because RTW in their size always looked huge... Whatever the reason may be, they will only be happy if they FEEL the coat on their waist and not if it only LOOKS like it has some waist suppression while it doesn't. Indeed, when the waist is suppressed more, back balance needs to be longer. Especially for sway or hollow backs. Just look at fashion magazines. Very slim cut suits are not a one year trend but it's been going on for years. And it's not a trick to the eye. It's really slim. With a strongly accentuated waist. Now the runway RTW is ugly and has big fit issues. My thinking is that the guy who buys Dior Homme or Armani or whatever hugely expensive RTW brand does that 1) for the name of the label and 2) for the feel of the clothes. Am I the only one wanting to be able to offer a bespoke suit with the aesthetics of current fashion? Oh, Posaune, I overread your post. Good! CJ, no, you're not the only one wanting to cut fashionable garments ! People who actually buy at Dior (I have a few customers who do) are slim guys. There is no problem to cut a slim fit for them, and it will be a really slim cut, not a trick of the eye. The problem is for biggers guys, with a drop 2 or drop 4. For those, it is possible to use "sleight of shears" to trick the eye, cutting a coat that makes them look slimmer than they are, when there is actually little waist suppression. It is even possible to do it for a customer who wants more ease than usual, because he likes to feel room in his coats. Doing this, you can cut a fashionable coat, that makes them slimmer, for customers who can't buy at Dior because the coats there just don't fit them. RTW target their customers. Dior customers are slim guys who are actually easy to fit. That's why their cut works on them. As tailors, we can't choose our customers, we have to fit people whatever their built. 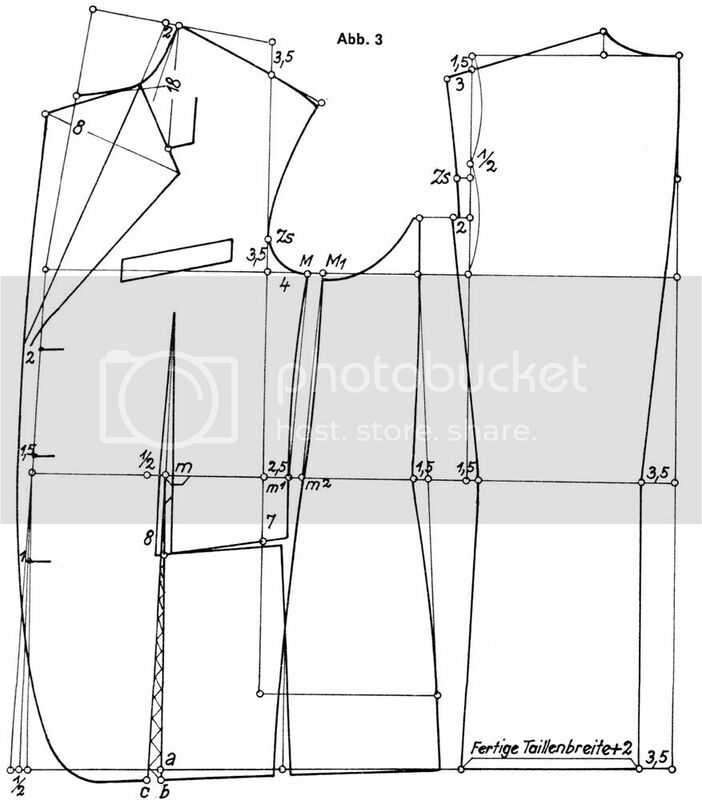 I'd love to visit Dior bespoke department, to chat with their tailor (a very talented guy, BTW) and ask how he deals with bigger guys who want the Dior look. Why are the days so short ? Posaune : for men too, if you suppress more in the waist, you need more length in the hips. It's just the same under the waist as it is over, where you need a longer back balance. These days, I think we overthink this seam while flt cutting. It is easy to roughly draft it, then at fitting rip it open and pin it starting from the armscye and going down to the hem. Takes only 5 minutes to do, and you can see the result immediately. Then you understand better the relation between waist suppression and balance. After a few coats fitted this way, flat drafting should get better. Am I the only one wanting to be able to offer a bespoke suit with the aesthetics of current fashion? Why would anyone desire to copy the (mostly) ill fitting RTW fashion garments? 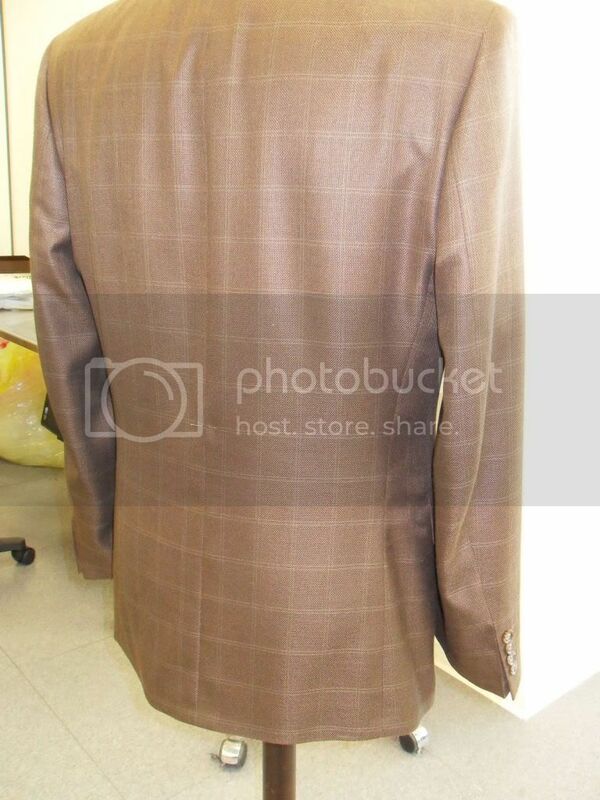 The way they cut their suits is often completely wrong (narrow front and back with a wide scye) and out of proportion. Customers who like that look usually buy it Ready to wear. But if you must copy it, just cut your "regular" patterns a size smaller and shorter and you're good to go. If you leave enough room for the chest the customer should be happy. BTW, it's not a stronger waist suppression in those coats, they are narrower/slimmer over all. They sometimes increase the suppression in the back, which can work , but in most cases the RTW versions look weird. The additional ease in the chest is roughly 12 cm. Problem with this is that not every body has a shape to correspond with that. So if a customer buys a coat that fits in the waist or hips or chest, the other areas may not fit. Hence the drags. Have a look at the text: "Decent waist suppression"! You inquired, "If it's very possible in womenswear to get a good waist suppression, then why not look for how to achieve that in men's wear?" In womenswear, waist suppression is a required feature of a popular silhouette. Thus the cutter's attention is focused on how to achieve waist suppression because the market demands that feature. For menswear, the popular silhouettes do not require very much waist suppression so cutters don't focus too much attention there. In addition, it takes higher fitting skills and more fitting time to achieve waist suppression features on sack coats. Thus it costs more money to make the coat fit the skin which is another reason the cutter is not motivated to focus on that particular result. First of all to summarize the original article this thread concerns: The article showed us a straw man then burned it down. They took a badly drafted coat and fixed it. The original cutter did not put the suppression in the correct place not matter who modeled the coat. 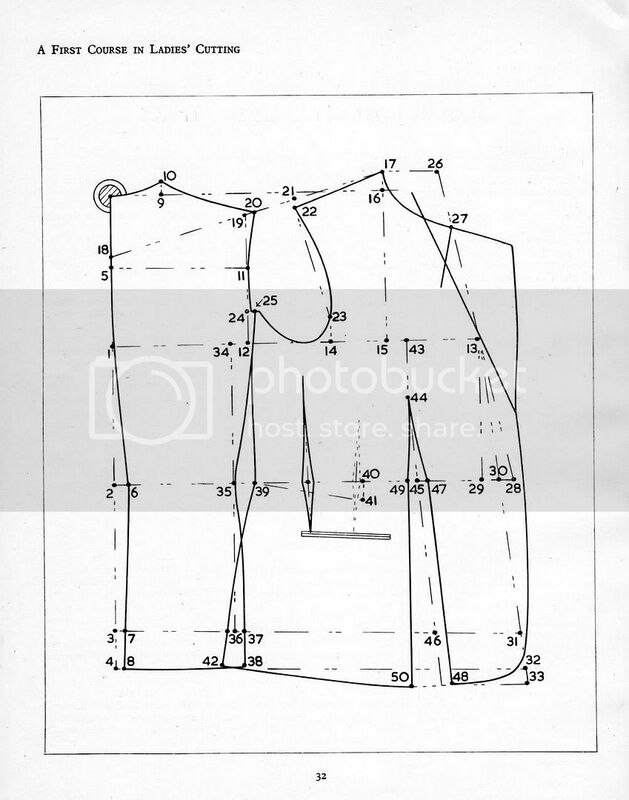 Maybe the measure worked out but the cutter had no drawing of the model's anatomy or maybe he was just an unskilled cutter without knowledge of men's anatomy. The other posters have shown us that this is a common drafting error. The cutter makes drafts based on correct measurements but misplaces the suppression because he can draw lines with the pencil but he is no sculptor. If you want a waist hugging coat you must start with allowing enough shoulder blade capacity, then proper back length, then allow front chest capacity, then proper neckpoint position. If you allow upper body capacity and get the balances correct, you will find little shaping is usually required in the waist area in order to get it to sit in. To get shoulder blade capacity you need proper CB seam shape for blades where ever they peak on the individual. Some clients carry blades high, some low. Some have a pointy part at top of blade. Don't be afraid the draw in and shrink the CB seam between blades (like an invisible dart). Next draw in a bunch of ease in back shoulder and use shoulder dart, then draw in back armscye, then perhaps draw in back upper side seam. Just make sure you have enough vertical and horizontal room in coat for the anatomy. If you concentrate attention on fitting the upper part of back, you will find that the coat will sit cleanly into the waist even with very little shape in the CB and back side seam. If the client is fatty in the back waist then try to make the coat short over the indentations and barely touch the fat or float over the fat. Only stretch a seam with due consideration. Once you put the shape in the upper back, fix the back balance based on looking at diagonal strains from chest to under arm or from blade to under arm. Don't confuse front/back imbalance strain with strain lines that point to insufficient shape for blades. You may even need to draw in and shrink the CB seam at waist as Ostinelli does if it looks too long on CB waist. Now move on to providing front chest capacity. I suggest cutting the front coat on the straight side with an under lapel dart. 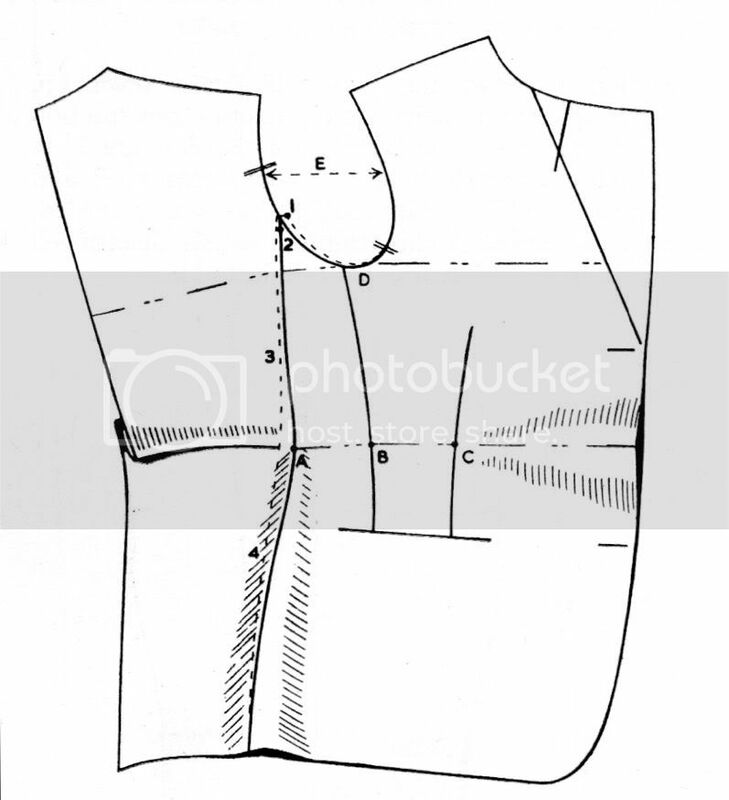 Before first fitting, draw in the front armscye a specific amount you determine. This crookens the coat a bit from the side, gives capacity to the chest and creates an anatomical shape for the arm joint. At first fitting the coat fronts might separate at the bottom away from CF. If they do, then pinch out the rolline until the fronts hang parallel. Take note of how much you had to pinch roll line. Whatever you pinched is whatever you will have to draw in with the bridle tape later and shrink out. Another possibility at the first fitting is that the front coat is not separating at the bottom hem but rather trying to come together at the bottom and separating at the CF top so much that it is falling off the shoulder ends. It is like a balloon at the side chest and crashing down tight on the hip. In this case there is no reason to pinch the lapel roll just yet. You need more length over the chest. Do this by moving neckpoint wider away from the CF. Either repin shoulders with the neckpoint more crooked at fitting or use ironwork to stretch it away from center front a specific amount you determine at fitting. Now after making the front neck wider, you might find the CF so long that it is separating at the bottom. If the bottom is separating, then pinch out the roll line appropriate for cloth and chest volume and take note for later sewing bridal tape. If the fronts are still separating away at bottom hem, then shorten the neckpoint from shoulder until they hang parallel. Ok now your coat is balanced front/back and side to side and has proper lateral chest capacity. If the center front is hanging parallel but not hugging the stomach enough under chest then you can take a dart from under bust point down to hem. 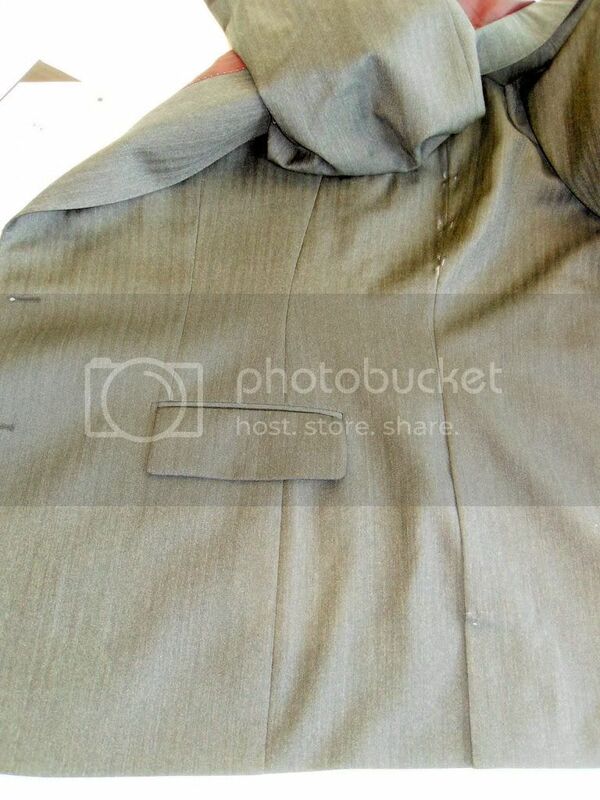 If you don't want the long dart there then just pin it out and transfer it later with hip pocket cut common on modern suits as shown on drafts in this thread. Then put your hands around his waist feeling where he is hollow and can take some more suppression. For example an on-grain suppression underarm dart or some shaping at front side seam at waist. Don't shape the back side seam too much. If you put too much shape in the back side seam either by stretching it or by pinning out an indentation in it, you are effectively shortening the area next to it on the same panel which is the blades and the hollow under the blades. You don't want to shorten the blade/hollow area because you already fixed the back balance in order to keep that area sufficiently long. However if you put shape, and thus length, into the front side seam, then you desirably shorten the area under the arm so that the cloth glides over the waist indentation without crashing on the hip. Have fun with the low shoulder while juggling all this. 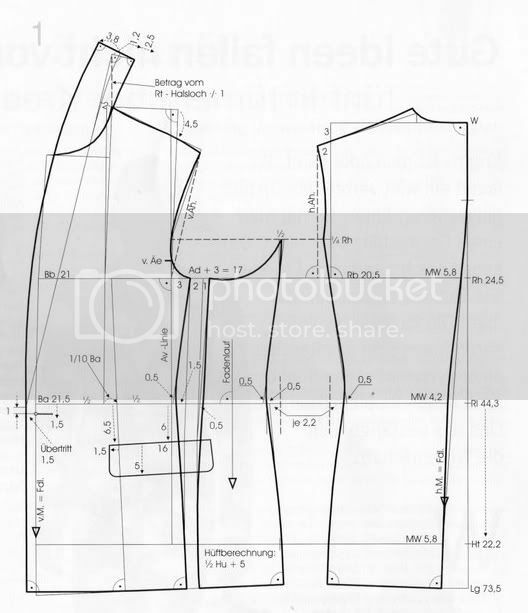 This kind of close body fit must be solved on the actual figure during fittings. Just draft without much suppression in waist assuming you be spending most of your attention figuring out the individual's upper body. If you have waist suppression issues, please post pictures of actual coats on the bodies so we can see what is the issue. I'm sorry I don't have math or geometry to solve problems quite unique to each individual client. Once you try it a few times, you can incorporate your tried and true shapes and amounts into your regular drafts. Probably your drafts will start looking like womenswear drafts except the your backs will be longer, the neck wider and armhole bigger than womenswear.